I was once told I use my lack of filters as Carte Blanche to say mean things, though. Which I think not true, as I don’t think I have a mean bone in my body. But what if this is one of those cases where I am the one needing the band-aid? Do you want Spongebob, Muppets, or Batman? I’ve been pondering this, because just having spent a week with you, I feel like I know you a million times better (though far from completely). You may kind of know someone (in a very genuine way) through online connection, but it’s nothing to spending a week with them, in person, in their home especially. I don’t think you would ever deliberately hurt someone. I think you completely lack the intent to be cruel. 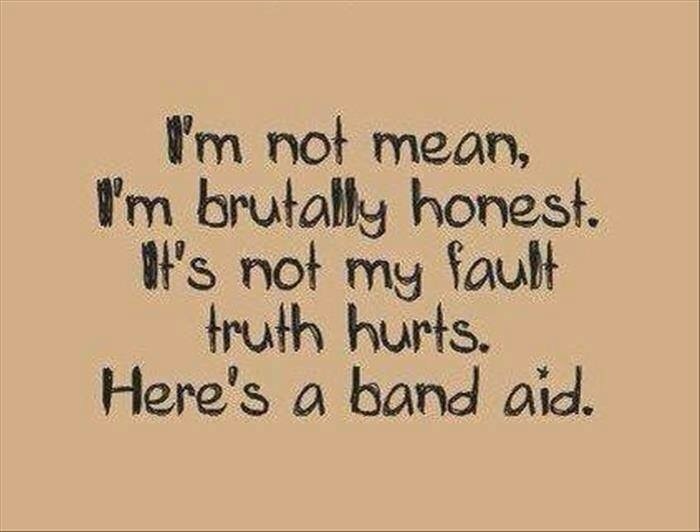 The thing that sticks for me: “I’m not mean, I’m brutally honest.” I get completely hung up on that word, ‘brutal’. It’s a very cruel word. I cannot think of any circumstance in which I would not be incredibly disturbed to have that word associated with me. This is great food for thought actually. I have always said that I am brutally honest but perhaps that is not the best way to describe it. I agree with you. Brutal is a cruel word. But you know how that other expression? That children can be cruel in their honesty? Have you ever watched the movie The Invention of Lying? That movie made me ponder a lot. But seeing the characters, that is how things come out of my mind. I’m trying to grasp and not quite getting the expression about children being cruel in their honesty. I’m not all here right now (thank you migraine). I haven’t seen the movie, but I seem to recall wanting to. I’ll keep my eyes open for a chance. I guess too that it’s just my personality to be as quiet as I ethically can be about others’ deficiencies and flaws. It’s one thing when it’s a serious issue, but if it isn’t, and if I feel it cannot be helped, generally I keep silent.